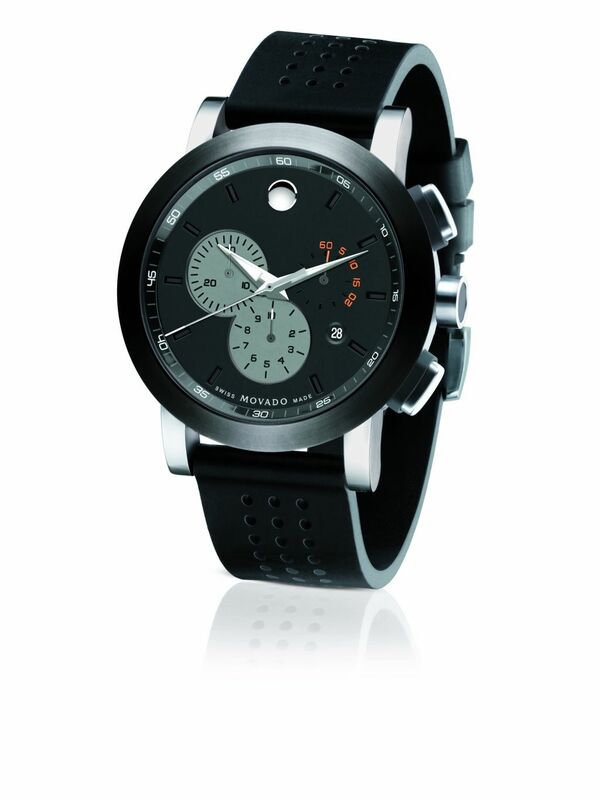 Introduced in 2011, the distinctly casual Museum Sport™ men’s watch, with its black PVD-finished stainless steel case, new black 3-hand Museum® dial with minute reflector ring and date display, and sporty perforated black rubber strap, became an instantly popular new interpretation of Movado’s most iconic watch design. Now for 2012, a signal Swiss quartz chronograph marked by bold, clean lines joins the Museum Sport family. Designed with straight, extended lugs and distinctive round pushers, its imposing 44mm round case is crafted of black PVD-finished stainless steel with a brushed/polished solid stainless steel case-back and matte black resin crown, and flat, antireflective sapphire crystal. Encircled by a black minute reflector ring with white index and branded by Movado’s signature concave dot at 12 o’clock, the bi-level matte black dial features a center-mounted, white-tipped chronograph seconds hand, small seconds subdial with red accents at 2 o’clock, recessed chronograph tenths-of-a-second subdial at 6 o’clock, recessed chronograph 30-minutes subdial at 10 o’clock, round date display at 4 o’clock, slender silver-toned dauphine hour and minute hands, applied black stick hour markers, and white lettering. The new Museum Sport Chronograph is engineered for precision. It can be used to time an event up to 29 minutes and 59.9 seconds in duration to the nearest 1/10 of a second; or up to 9 hours, 59 minutes and 59 seconds in duration to the nearest full second. Presented on a dot-patterned perforated black rubber strap with polished stainless steel tongue buckle, this casually commanding timepiece is water resistant to 3 ATM. Movement: Precise 1/10-of-a-second Swiss quartz chronograph movement. DIAL: Bi-level matte black dial with center-mounted, white-tipped black chronograph seconds hand, small seconds subdial with red accents at 2 o’clock, chronograph tenths-of-a-second counter at 6 o’clock, chronograph 30-minutes counter at 10 o’clock, round date display at 4 o’clock, applied black stick markers, silver-toned dauphine hour/minute hands, rhodium-plated concave dot at 12 o’clock, white indices and lettering. CASE: Black PVD-finished stainless steel case, crown and chronograph pushers with stainless steel case-back. Flat, scratch-resistant, antireflective sapphire crystal. Water resistant to 3 ATM. BRACELET: Black perforated rubber strap with stainless steel classic tongue buckle.